Pop the herbs and flowers into the holes of an ice cube tray, fill with water and freeze for 2-3 hours until solid. 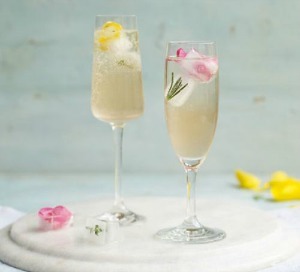 Pour the cordial, elderflower liqueur, gin and a large handful of ice cubes into a large jug. Stir until the outside of the jug feels cold then strain into four tall glasses or champagne flutes. Top with sparkling water and add a few more ice cubes and the floral and herb ones too. Serve immediately.